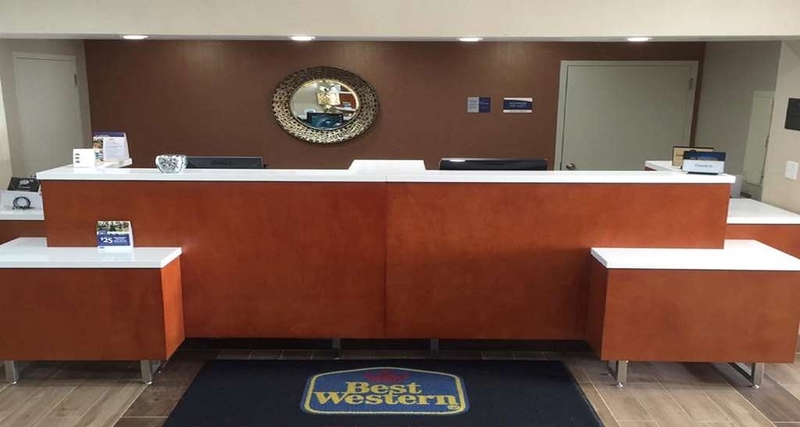 El Best Western Mountaineer Inn se encuentra en el centro de Morgantown. Venga y disfrute de las mejores atracciónes turísticas cerca de nuestro hotel. Precios bajos garantizados y ofertas exclusivas. 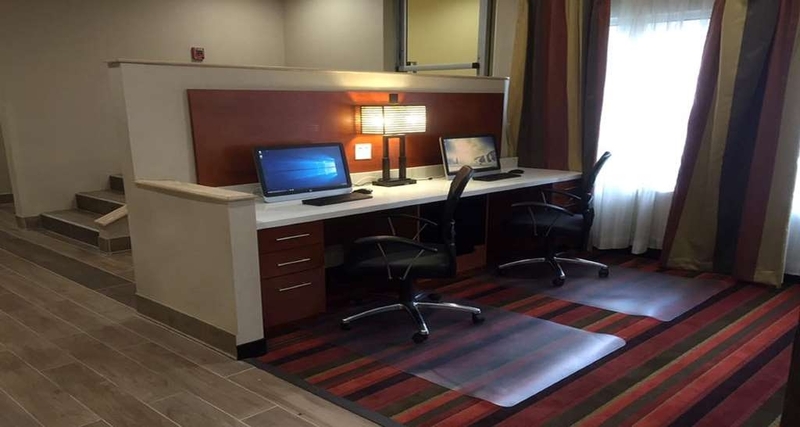 Bienvenido al Best Western® Mountaineer Inn. 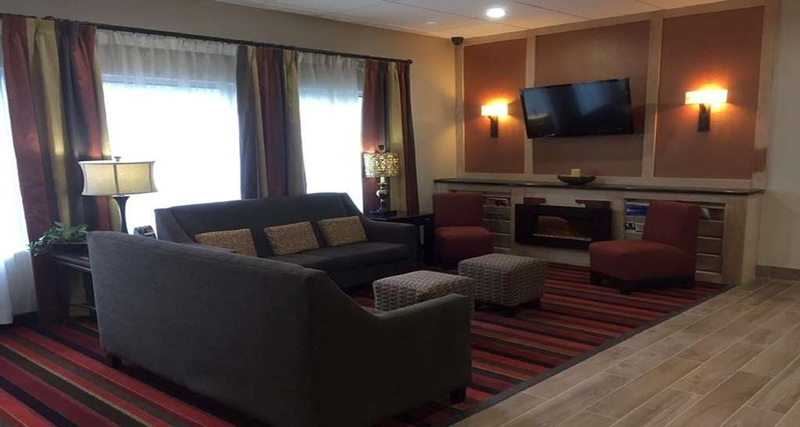 Este hotel BEST WESTERN de Morgantown, Virginia Occidental, ofrece a los viajeros todas las comodidades propias del hogar, incluyendo un ya legendario desayuno continental gratuito con autoservicio de gofres y todas sus especialidades preferidas. Disfrute de la comodidad de contar con un gimnasio entre nuestras instalaciones y de estar situado a solamente unos minutos de los principales eventos celebrados en la WVU. Este hotel de Morgantown, Virginia Occidental, da la bienvenida a huéspedes en viaje de placer o de negocios. Los pacientes médicos de viaje en la región para visitar el Hospital Ruby Memorial podrán disfrutar de la mayor comodidad en sus desplazamientos y los viajeros de negocios que deseen visitar Mylan Pharmaceutical® pueden contar con nuestro personal para disfrutar del mejor servicio de la ciudad. ¿Busca un hotel en Morgantown, Virginia Occidental, durante su viaje de negocios? Manténgase conectado en todo momento durante su viaje y disponga de acceso total a nuestro centro de negocios. No obstante, si se encuentra en viaje de placer, nuestra resplandeciente piscina cubierta le ofrece el espacio idóneo para relajarse. Si se encuentra aquí para asistir a un partido de fútbol en el estadio Mylan Puskar o al Mountain Festival, que atrae a numerosos aficionados al ciclismo procedentes de todo el mundo durante su recorrido por la carretera nacional 50, podrá acceder con la mayor comodidad a estos enclaves al tiempo que disfruta de nuestras lujosas instalaciones. Si busca un hotel en Morgantown, Virginia Occidental, situado cerca del West Virginia® University Coliseum, el Creative Arts Center en el campus Evansdale de la WVU® o la Mountaineer Statue, el Best Western® Mountaineer Inn leofrece la opción de alojamiento idónea. Los huéspedes estarán situados a menos de 1,5 kilómetros del centro de Morgantown, lo que le permitirá acceder fácilmente a pie a las mejores tiendas y restaurantes. Incluso si se encuentra aquí para asistir a una reunión con el Departamento de Energía (DOE) podrá acceder igualmente a numerosas oportunidades de ocio. La sede central de FBI se encuentra a solamente 30 minutos de distancia y nuestro hotel de Morgantown, Virginia Occidental, da la bienvenida igualmente a numerosos funcionarios gubernamentales. Con el National Institute for Occupational Safety & Health (NIOSH) situado igualmente en las proximidades, nuestro personal se encargará de que todos los trabajadores gubernamentales dispongan de lo que puedan necesitar durante su estancia. Nuestro hotel goza de una fantástica ubicación junto a la salida 155 de la I-79, junto al University Towne Center. Reserve su estancia en el Best Western® Mountaineer Inn. "Fell below expectations for a BW"
The place and staff were very helpful. The pool was great. The breakfast was great. The place could do with some remodeling and painting. Very helpful and friendly staff. The hotel is located in an easy and excessable place. "Misleading ad about stay 2 nights and third is free"
Found out upon checking about free night that it is only for new members.Was not told this at first place.we drove nine miles out of our way for the second hotel and the clerk was not very friendly advised that it was only if you were becoming a new member.I told her why didn't,t the girl at the first hotel did,t tell me instead of sayind it will take effect in about two weeks. We stayed at the Moutaineer Inn as a half way stop on our way back home from a family trip to Myrtle Beach. It's right off I79 and there's lots of options for food /gas etc rogjt by the hotel making for a great location. The staff are friendly and helpful and the included continental breakfast is great. 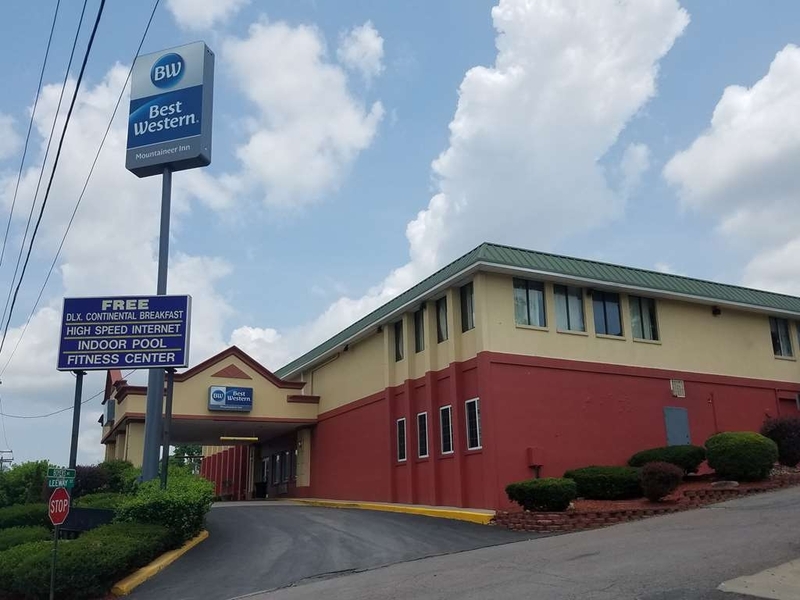 If you're in Morgantown or need a hotel while passing through I would definitely recommend the Best Western Mountaineer. Good place to stay for the price. Had a panhandler in the parking lot asking for money. We didn't like to have to turn down but not enough money to travel and give out cash. Overall the staff there wren very nice. The hotel is conveniently located right off the highway. A number of restaurants and gas stations are close by. The breakfast provided by the hotel is outstanding. Make your own pancakes make your own waffles sausages eggs. A variety of coffee tea and juices are available. There is ample room to sit and enjoy breakfast in a very nice a Lobby. We were going to the basketball game and just needed a place to stay. I booked this based on location and the price. That's where the good news stops. From the outside and the lobby it doesnt look bad. Once we got into the room the bathroom was disgusting and dirty. When we got back from the game my daughter went to take a shower and the water didnt come on. Luckily the girl who checked us in switched us to the room across the hall but still a hassle especially after long day and at 11pm. The next room had working water but it was still dirty too and lacked supplies (tissues weren't replaced nor the toilet paper). Guess you get what you pay for but still should be clean. "Not Pet-Friendly (as in no grass) for a $30 fee"
We decided on Best Western Mountaineer Inn because my husband travels and said that the BW in a circle meant that the facility had been upgraded and renovated. This one also advertised pet friendly (I should have checked Bring Fido) and there was a discount coupon in the travel magazine that I picked up at the welcome center. Both are deceiving. They did not honor the coupon, as per the manager, and there is no grass for pets. They do charge a $30 pet fee. They accept AARP and AAA memberships for a room discount, but if you need to use the coupon and have a pet, this is not the place for you. While dated,it was very clean. Free wifi and a nice tv. with good reception, though not too many channels. Water pressure for the shower is exceptional and there is plenty of hot water. Just be careful as the tub in our room slanted somewhat and I needed the grab bar to keep from sliding. It is easy to control the heat/air in the room, and the beds were fairly comfortable. There is a fridge and microwave in the room; and while I did not see or use them, they advertise a heated salt water pool and a fitness center at the front of the facility. I also saw several computers in what is probably the business center. 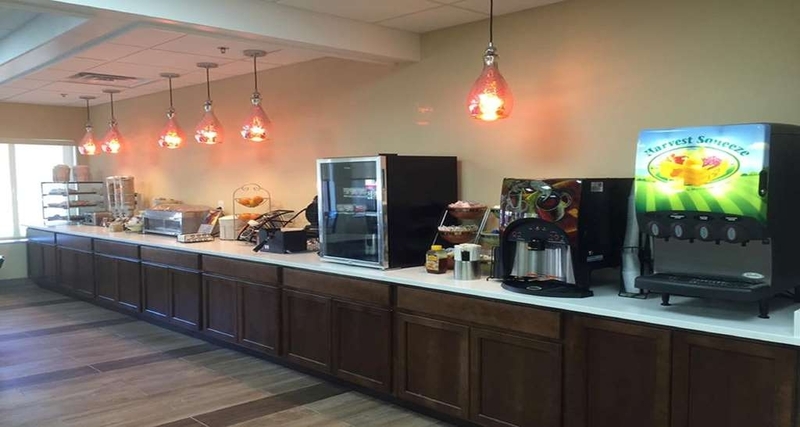 A full breakfast is served outside of the front desk, in the breakfast area, that includes eggs, biscuits and gravy, cereals, yogurt, breads, pastries, and a variety of beverages. I am sure that there were more things in the breakfast area, but there is plenty to eat and the area is spotless. My one star is because having a true dog-friendly facility was the main reason we chose to spend the night here. If that is not important to you and you do not need any discount, then this is just fine for a night or a few and worthy of at least three stars or maybe more. "Will do for the location"
Was not at all impressed with the room (129). Upon checking in proceeding to the room (129) it smelled damp and felt damp. Even at night the sheets felt damp and made sleeping uncomfortable. My skin felt sticky all the time that I was in the room (129). Unsure if this was the case in all the rooms on the first floor or just the room (129) I was in. I liked the location as it was close to my child and the football stadium the prices of all the other hotels in the area were $$$. I might think to try the hotel again on the off chance that room 129 was just not the greatest of rooms at the hotel. I had to book with them last minute as my airbnb host cancelled on me same day. The price was SUPER reasonable and they were so accommodating. The breakfast was outstanding. The place is much better than a 2-star hotel imho. Few years ago we walked in and walked out. Hall floors were dirty and smelled. Rooms smelled. Went back Sept 19th and were glad to see improvements. breakfast was good , rooms clean. keep up on improvements and we will be back. Room was clean and customer service was good. However, bathroom was tiny, parking lot was small and access to and from was difficult. Breakfast choices were limited. Internet was easy to use and speed was good for working and streaming video. The friendly and helpful staff always makes our stay at this hotel a pleasure. No hassles. It was great to see that the property was recently remodeled and upgraded to remain current. As a an elite member, the staff could not be more accommodating. Thank You!! We really were comfortable and welcomed in this hotel. Hotel staff were very pleasant, pool was clean and warm, food was good. Internet was fast and overall we had a wonderful stay after a very long day of driving. My husband and I stayed there during a trip to Morgantown for our young grand daughter having surgery at Ruby Memorial. Room was in his name. Room smelled of mold. AC unit had visible mold. No clean towels or trash taken out the two days we were there. This resulted in gnats gathering in the room. Men hanging out in parking lot till all hours of the night drinking. The morning we checked out, our clothing that was hanging on clothing rack was damp and smelled like the room. The only two good things I can say , The internet was great and the front desk workers were very friendly. This is a beautiful hotel. The outside facade is lovely. The indoor decor warm and inviting. The rooms are spacious and well appointed. The staff is very knowledgeable and helpful.. The amenities are excellent. The pool area was immaculate. This is one of the nicest BWs we have ever stayed at. "Place to be in Morgantown!" Excellent staff, excellent mangement and excellent facilities. The beds are super comfortable and the breakfast is truly a real breakfast! The gym is good enough and the pool is excellent as well. I highly recommend this hotel for business or family. Andy, Thank you so much for your kind review. We appreciate your feedback and are happy to hear that you enjoyed our hot buffet style breakfast, indoor heated salt water pool, and fitness center. We pride ourselves on our hospitality and are delighted to hear that you enjoyed your visit. Thanks Again!!! The worst! The hotel room was dark, the bathrooms seriously small. We settled in the beds were horrible. Went to take a shower the water to the tub was not working. They moved us to a new room. Didn't work in the new room either. So again we had to pack up and move to another room. This time the shower did work. Beds in this room were horrible too. Not to mention we found a bug on the bed!!! The parking lot to the hotel had a lot of people just loitering like a club. It was creepy. Afraid to go to the car after dark alone. Never again will I stay there. I will pay extra and stay somewhere else. Like Holiday Inn. Do not stay here. Hotel was very clean and lobby was pleasing to the eye. Customer service staff was able to give us an early check-in after an all night trip. Both beds were clean and comfortable. Only issue was a dripping sink in the bathroom, but other than that - Awesome. We needed a room for the night bc my daughter was having a prcedure dont at the hospital early in the morning, so we booked a room. The pool was nice, the staff was friendly, and our overall stay was good. Would recommend and will stay again.. Thank you so much for taking the time to review our hotel. We are delighted that you were able to enjoy our indoor heated pool and that our staff was friendly. We hope you were also able to enjoy our hot buffet style breakfast and free Wi-Fi. We wish that your daughter has a speedy recovery and look forward to seeing you again during your next visit to Morgantown. Thanks again for taking the time to review the Best Western Mountaineer Inn. we were on our way home from north carolina, when hunger and tiredness struck. so we decided to see if there was room at the Best Western Mountaineer Inn. and luckily there was. I even had a coupon from the coupon book I picked up at a gas station. cool. our room was very comfortable, except for the bathroom door. it did not shut. oh it closed sort of, but not completely. which really didn't bother us because it was just us two. and, I did mention it on checking out. other than that, our room was GREAT. and the breakfast---holy cow!!! what a breakfast! the normal toast, bagels, coffee, tea, juices,pastries, but then, yummy looking donuts, scrambled eggs, bacon, some cream sauce and those big waffles. DELICIOUS! we really enjoyed it. and, get this: the pool and fitness center are open 24 hours a day. if we weren't so pooped, we would have loved to be in the pool. hopefully, next time. boy oh boy, we sure made a GREAT choice. Chickqueene, Thank you so much for taking the time to review the Best Western Mountaineer Inn. We appreciate your feedback and are delighted to hear that you were able to enjoy our hot buffet style breakfast and that you noticed our indoor heated pool facilities and fitness center. We are sorry that your bathroom door was not satisfactory and will be sure to address this with our maintenance department immediately. We are ecstatic to be your choice property while visiting Morgantown and we look forward to seeing you again during your next visit. Thank you again for taking the time to review our hotel. I visited this college town for a business conference. This Best Western was convenient to I-79. I was greeted by smiling faces at the front desk. After a long drive I needed a nap to re-energize before heading out to a cocktail party that evening. My room was comfortable and inviting. Breakfast the next morning was good. I saw an indoor pool near the entrance. Unfortunately I didn't have time to enjoy it. Morgantown is a place I plan to return to and I will definatly stay here again. Thank you so much for taking the time to review the Best Western Mountaineer Inn. We are happy to hear that you enjoyed your visit and that we were able to satisfy all your needs while visiting Morgantown. We hope during your next visit that you will be able to enjoy our indoor heated salt water pool. Thank you again for your kind words, we look forward to seeing you again soon. The reception staff were very friendly. The lobby and the areas we walked through to get to our first floor room ( at the end of the corridor) looked pretty good. Our room was clean. The bathroom was also clean. However, it needed a lot of repair. There was dry rot and paint chips on and behind the door. The bathroom mirror had a large chipped area. The bathroom ceiling had some loose tiles and water spots. The doors were very noisy. Our door had a gap from the top to the bottom. This would not be good if there was any smoke in the corridor. There was doors opening and closing as well as conversation between 12:00-2:00 AM right near our room. It was difficult to sleep. We were thinking that we were in luck with a room so near the end of the corridor. Breakfast was quite good. A thumbs up for having the biscuits in a heated compartment. Thank you for that touch. Exiting the area was difficult due to heavy traffic and a large bush blocking the view. There are restaurants quite near, but due to heavy traffic and lack of traffic lights to allow crossing in those areas, it is risky to visit them. Johnson747, We appreciate you taking the time to review our hotel and on behalf of our entire team please accept our sincere apologies for not exceeding your expectations. We take all our guest feedback seriously and will be sure to address your concerns immediately. I am delighted to hear that you were able to enjoy our hot buffet style breakfast and our excellent customer service. We hope during your next visit you will be able to enjoy our indoor heated saltwater pool or our fitness center, both available 24 hours a day. We look forward to seeing you soon and thank you again for reviewing our property. Manager was friendly and accomodating. Rooms were clean. Nice pool. Nice workout room. Many options for breakfast. Courteous staff! Very friendly and informative. They were ALL willing to help with restaurant recommendations, extra towels, even had games for the kids to play! Dont let the few bad reviews fool you, this is a very nice property. Thank you so much for taking the time to review the Best Western Mountaineer Inn. We are delighted to hear that you and your entire family enjoyed your visit as well as our excellent customer service. I will be sure to share your review with our entire team. We hope to see you soon, during your next visit to Morgantown. Thanks Again! This hotel is located on the side of a mountain and has a very short driveway to get into the hotel. It is near a few restaurants but they are hard to get to. In fact walking to a restaurant is nearly impossible. Our room was comfortable but small. The bathroom was very small. Staff at breakfast were pushy. I could not just grab a cup of coffee because they were trying to educate me on how to get coffee. Alphawolfie, Thank you for taking the time to review our hotel. We are sorry to hear that you found our hotel difficult to find. We are also sorry that you did not find out staff helpfil. We pride ourselves on excellent customer service and will be sure to address your concerns immediately. Thank you again for taking the time to review our property. We hope that you would consider staying with us again during your next visit to Morgantown. We had a great experience. All the staff were very friendly and professional and breakfast was delicious with enough variety. We enjoyed the common use computers and the WIFI and complimentary paper. Very quiet rooms and comfortable beds. The hotel was fully booked with baseball and running teams and we did not hear any of them – that's how quiet it was. The fitness area is decent with ellipticals and total workout machine. This hotel is close to many dining options, gas stations, the highway, and also a park (with playground) for an evening walk. Mmichalk, Thank you for taking the time to review our hotel. On behalf of our entire team we would like to say thank you and that we sincerely appreciate your feedback. We are delighted to hear that you were able to enjoy our hot buffet style breakfast and that you enjoyed our complimentary WIFI and business center. 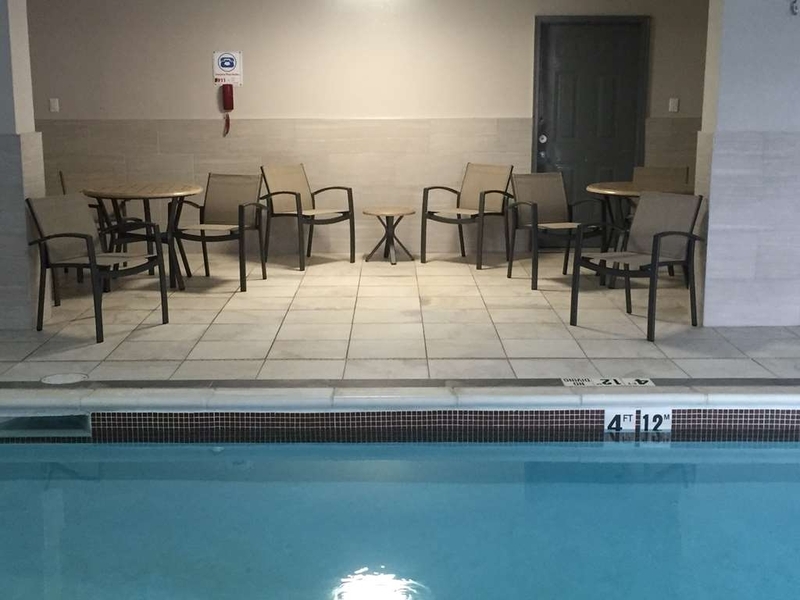 We hope next time your visiting you can try out our indoor heated salt water pool. We are proud to offer excellent customer service and look forward to seeing you during your next visit to Morgantown. Thanks Again! "Worst Best Western ever! Stay away." Edwin, On behalf of team please accept our sincerest apologies. We appreciate you taking the time to review our hotel as well as your loyalty to the Best Western Brand. Please understand that your experience was not typical of our hotel, and management as well as ownership has taken swift and appropriate action to correct the deficiencies you have encountered. Again, please accept our sincerest apologies. Chris, Thank you again for reviewing our hotel. We understand your experience was not satisfactory and take all your comments seriously. We are sincerely sorry that you did not find our hotel satisfactory and appreciate your business. Thank you again! Convenient to campus and interstate. Clean comfortable, no-frills plain room. Good value. Desk staff very helpful in pointing us to a good local, non-chain family restaurant. Basic breakfast fare with good coffee. Thank you so much for taking the time to review our hotel. We sincerely appreciate your feedback. We are delighted to hear that you enjoyed the stay and that our friendly staff was able to get you to our local restaurants. We are also glad that you enjoyed our hot buffet style breakfast. We thank you for choosing our hotel and look forward to seeing you during you next visit to the Greater Morgantown area. Thanks Again!!! Glenn, Thank you for taking the time to review our hotel. We are glad that our staff was friendly and that our property was clean. We are proud to say that we are beginning to renovate our hotel. 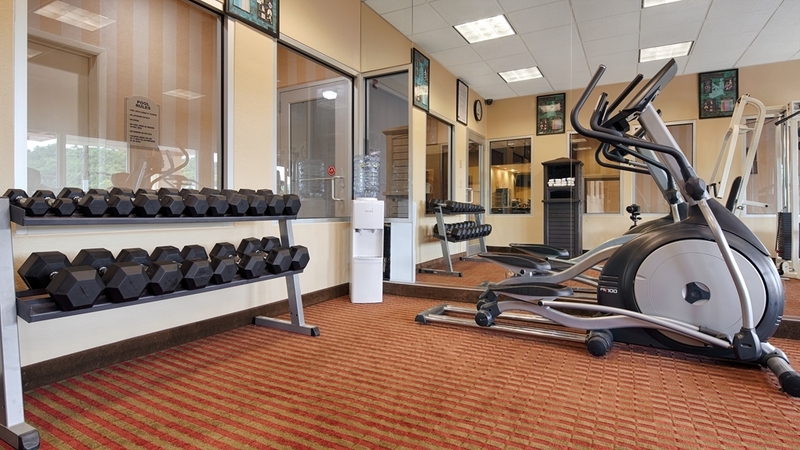 We have completed the fitness center and have started our hallways, with minimal impact to our guests. We hope that you will consider staying with our hotel again during your next visit to the Greater Morgantown area. Older hotel, but room was clean The staff was really friendly, pool was good, breakfast was great. The hotel was dog friendly and our room had hardwood floors so no previous pet odors. The location is convenient and close enough to walk down to the river. It can be a little hard turning out of the hotel due to traffic but we had no real problems with it. Thank you so much for your kind review. We are glad that the staff was friendly and that you enjoy our breakfast. I am glad that you enjoyed our indoor heated pool. We will be sure to share this information with our team. We look forward to seeing you next time you visit our area. Just average...breakfast was not wonderful. The shower curtain was dirty...called the front desk and requested a replacement...unable to do so til the morning. The room smelled like old wet rags. Thank goodness I had a diffuser with me. Pool heating system was down. The beds were comfortable. The price was right. Staff was friendly. Thank you for taking the time to review our hotel. We are deeply sorry that it was not what you expected. We are aware of the heating system in our pool area and have ordered the replacement parts to get it taken care of. I'm extremely sorry that you found a dirty shower curtain, that is not our standard and I will be sure to address this issue with our executive housekeeping team. We will be sure to immediately fix this problem so that it does not happen again in the future. Thank You again for taking the time to review our property, we appreciate your feedback and hope you will give us another chance to provide you with superior customer service. We stayed on night for a cheer competition. We normally stay at event venue, but couldn't justify the $175 price tag. We booked this hotel along with a few other families. I am glad we did! The hotel is easy to get to. The staff is very friendly and helpful. All areas of the facility and rooms were clean. Beds were comfortable. Our kids enjoyed the pool and we all enjoyed the breakfast. I will definitely be staying again! Thank you so much! We appreciate your review. We were ecstatic to be able to be your host hotel during your cheer competition, even though we were not hosting your event. 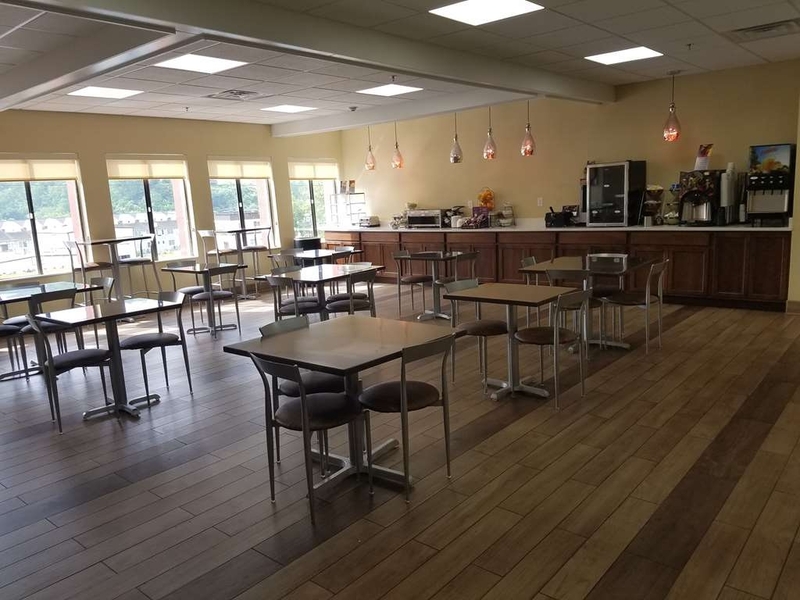 I am glad that we were able to provide a great breakfast, friendly staff, and clean rooms. We are also happy that we were able to burn off the extra energy that kids had in our indoor heated salt water pool. We look forward to seeing you again during you next adventure to Morgantown area. We had to come down for the weekend for basketball, great room for the price, and the breakfast was fantastic. The rooms could use some updating but very convenient to everything and staff was very friendly and helpful. Thank you very much for reviewing our hotel. We are extremely happy to hear that you enjoyed your stay and that our staff wad friendly and helpful. We look forward to seeing you again during your next visit to the Morgantown area. Thanks Again!! 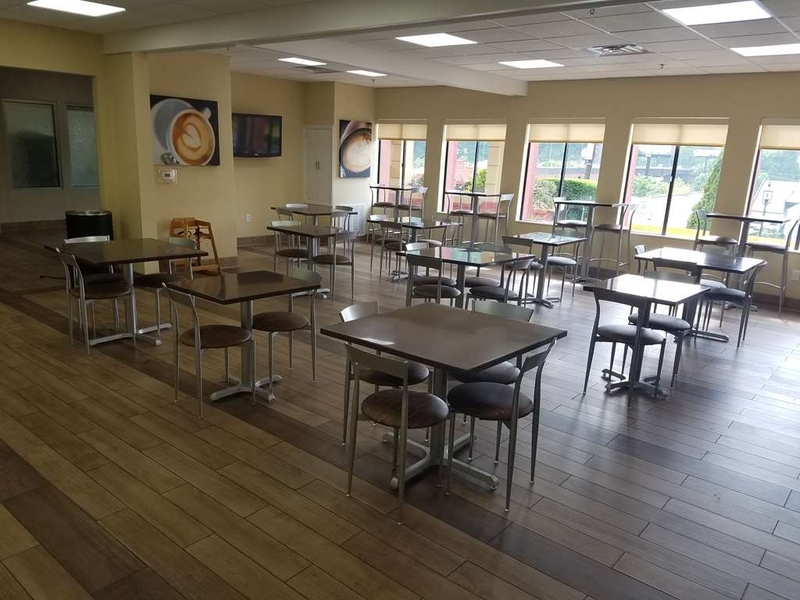 "Great Value and Convenient Location"
This hotel is priced very well and is located within a mile of WVU's Evansdale Campus (Collesium, and Creative Arts Center). The staff was wonderful and the rooms include all of the typical amenities. Thank you Bruce for your review of our hotel. We appreciate you comments and are very glad you were satisfied with your recent visit. I will be sure to share them with our entire team. We hope to see you again during you next visit to the Greater Morgantown area and appreciate your business. Thanks Again!!! Thank you so much for your kind words. We are happy that you enjoyed our hot buffet style breakfast as well as our indoor heated salt water pool. We hope to see you again during you next visit to the Greater Morgantown area and look forward to being your home away from home. Thanks Again!!! "Good value for your Buck!" Good value . spacious room . Convenient location . Appreciated having coffee in the lobby 24/7. Standard hotel breakfast ...nice to have it available...especially on a snow day. We used the pool and fitness center which is open 24/7. It isnt the Ritz but neither is the price. Thank you so much for sharing about your stay. 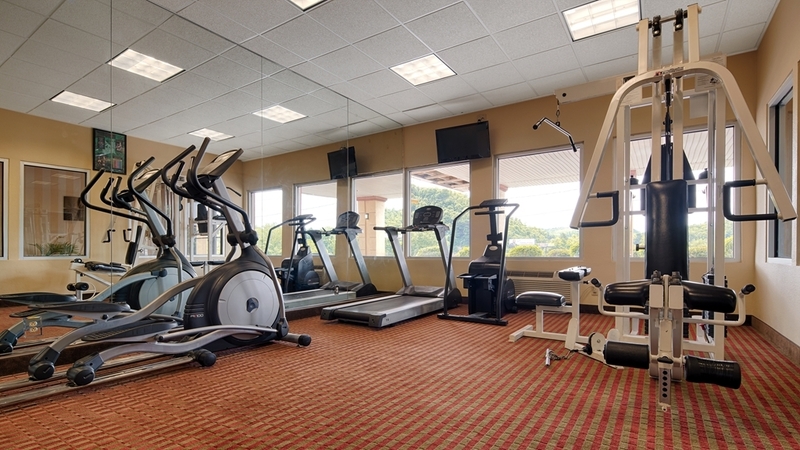 We are glad that you were able to enjoy the indoor pool and fitness center. We will be sure to share you experience with our entire team. We hope that you will chose Best Western Mountaineer Inn during you next visit to the Morgantown area. Thanks Again!! Have stayed in the same room for a couple of times but since our last visit in October, some things need some improvement. Housekeeping... dead stink bug on AC unit, toilet paper in toilet on arrival, light bulb on floor lamp flickering off and on, TV's color is way off but finally have HBO. Internet still an issue with trying to connect only to Pandora. Already had the BW on the phone but still would not connect. I really don't want to call a number to get it connected. Why is it soooo hard? Skinner, On behalf of our entire team, I would like to apologize for not exceeding your expectations. Your satisfaction is important to us and we will be using the feedback you gave us to implement improvements to ensure we offer a better experience for guests in the future. We appreciate your feedback, its with guests like yourself that we are able to learn and grow. We are proud to say that we have officially upgraded and changed our entire network. Officially as of Feb 15,2018 we have a new wireless network, with more access points provided by Vista Communications. We were able to accomplish this because of feedback we received from guests like yourself. I hope that you will consider staying with us again so that we can have another chance to provide you with a superior experience. If I can provide any assistance, please don't hesitate to contact me directly at 304-599-5399. Showed up to an empty lobby and didn't think we'd ever find someone to check us in. Evidently the young man working the front desk was the only employee working. He said he was helping a guest with a problem so had to leave the front desk. My wife tried to get me to leave and find another hotel, but I was determined to stay till we found someone since we had a reservation. I am extremely sorry that our staff was attending to other guests needs, I will be sure to address this with them, as well as make sure we have adequate staff on hand at all times. I can understand how upsetting it would be to come into an empty lobby and on behalf of our entire team, I would like to apologize for not exceeding your expectations. Your satisfaction is important to us and we will be using the feedback you gave us to implement improvements to ensure we offer a better experience for guests in the future. I hope that you will consider staying with us again so that we can have another chance to provide you with a superior experience. If I can provide any assistance, please don't hesitate to contact me directly at 304-599-5399. Stopped overnight while traveling from GA to NY. The hotel is very basic but comfortable. It appears they are in the process of updating their interior which is badly needed. The breakfast buffet was not ready at the scheduled time. "Great stay during WVU Graduation"
Highly recommend for stay during winter graduation or events at basketball arena. Indoor pool is great for play during outdoor fridgid temps. Rooms are spacious. Room we had was no carpet, perfect for pet friendly place. We rented 2 rooms for the Dec graduation at WVU. It was very convenient to everything for the graduation site and the downtown area. There was an Aldi nearby and a Golden Corral. The hotel staff were great. The breakfast was better than the usual “free” breakfasts. Good eggs and good sausage gravy. The look baby was adorable and all the hall entries were decorated nicely. Very nice visit. Thank you!!! I stayed here for one night during the week on business. The hotel sits up on a hill but has plenty of parking. The hotel itself is somewhat dated although the room was clean. My only issue was that the bathroom was extremely small. Your average RV has a larger bathroom. Thank you for taking the time to review our property. I am happy to hear that your room was clean and satisfactory. I will be sure to share this with our housekeeping as well as with our entire team. I am extremely sorry for the size of our bathrooms. Our property does have smaller bathrooms, it is something that our ownership as well as management is aware of and we are working on a solution to this problem. If I can be of further assistance please feel free to contact me directly at 304-599-5399. I have stayed here numerous times in the past.....the hotel is becoming run down. The mattresses were way to hard. The quality of breakfast items was very poor. No bread for toast. The 2% milk had gone bad. The clothing attire of the morning cook/preparer of food was not appropriate. I usually have to visit the Eye Institute twice a year, more if there are problems, and we stay at this Best Western. It is conveniently located for me and a good value. The staff is friendly and the facility is always clean. The staff and hotel make an otherwise pain of a trip to be quite relaxing. had to stay close to the hospital and was referred here. The staff were friendly and helpful. our stay was day by day and my kids enjoyed the pool. Thank you to the staff. (our stay was over Thanksgiving 2017) there were some small issues but not important enough to mentioned. if it was overpriced then i would be upset. On our stay the high speed internet was very difficult to access with both our devices and once we did get on the internet was extremely slow. Other than that the hotel was good with comfortable beds and clean. Thank you so much for your review, I am proud to say that we have replaced all our routers and during our wifi upgrade, we have discovered areas that are not adequately covered. With that being said, we have teamed up with a reputable wifi company that specializes in hospitality internet, and are currently working to resolve our internet issue. We appreciate your comments and are working to resolve this issue. Thank you once again!!! "Good enough for a nights stay"
Overall nothing special, but a nice clean place to lay your head when you need to get off the road. It is close to the highway, with a fair amount of things in the area. The bed was ok, and the room clean. We would stay again while traveling through the area. i would not recommend this hotel. The internet service was very poor and the staff was unable to help resolve the issue. Our room was not cleaned during our stay. The staff was rude to us while using the common areas of the hotel. Jessica, I first want to apologize that our staff was unable to resolve your internet issue. I can assure you that these issues have been addressed. We are installing a brand new wireless system this week beginning on 11-17-17 and increasing our access points to allow guests to easily connect. Besides changing our entire wireless system, we have also increased the speeds of the internet we currently are receiving, so that guests that are connected have faster speeds and can navigate better. I apologize that our staff treated you in a manor that came off as rude or unwelcome. I will be sure to speak with our entire team about hospitality and making every guest and visitor to our hotel feels welcome. I hope that you will give us another chance to provide you with superior customer care. I sincerely appreciate all your comments and concerns and please rest assure that we are addressing all of them. I have stayed here a few times when visiting my son at WVU and attending football games. The rates are a little higher on game weekends but not as bad as the hotels closer to the stadium. Rooms are reasonably clean, my youngest son loves the pool and the breakfast is a nice addition. beds are very comfortable. breakfast is not very good.value of room is ok . do not get a room when there is a football game is going on you will not get a room unless you pay double and a two nigh stay. this is a good value if you going to the hospital for test. We stayed at the Best Western in Morgantown, WV while in town for a WVU football game. This was our first time in Morgantown. The front desk staff was extremely helpful and and eager to give us tips on restaurants and other attractions in the area. The hotel in general had a relaxed, inviting atmosphere. Everyone, including other guests, were all laid back and friendly. It was very much a friendly, inviting place to stay! I respect they are working on renovating, but there's still a ways to go. On the positive side- the lobby is nicely done, the breakfast is good, they give you a little welcome bag with water and snacks, the towels are soft and white and the rooms have microwaves and fridges. On the negative-the bathrooms are tiny and still in need of renovating, our room had a bad smell, the mattresses are rock hard and it's difficult to control the room temperature well. While I recognize it's in a college town, it's not college kids staying in hotels. The front desk staff was great. Aaron and Abby were so accommodating. The rooms were smaller but very clean. I was happy to see they had multiple options on the breakfast bar, with my family of 4 to eat a breakfast like that would have been 30 dollars. It was a very great value. I have stayed at the Best Western in Morgantown, WV for the past 6 yrs. due to medical procedures at Mon General Hospital and Ruby Memorial Hospital. I have always received a discount and have been treated with the utmost generosity and help! It is very convenient, safe, clean, continental breakfast is the best one could ask for. Thank You Albert! We love having you as a guest and appreciate your loyalty to our property as well as our brand. We look forward to your next visit to the Greater Morgantown area. I will be sure to share your comments with our staff. Thank you again!!! room was nice, but it wasn't cleaned for our second day, and when pointed out to management, no corrective action was taken. neither local nor central hotel management has responded in any way to my complaint, so am finally writing this review after several days of waiting..
We have stayed at the Best Western Mountaineer in Morgantown WV on several occasions. Always received great service. Place is very clean. The complimentary breakfast is always great with a lot of items to choose from. It is a pet friendly hotel with pets only on the first floor. The room was completely dirty, the bed did not have clean sheets, there was still trash in the room from the guest before me. The tub was dirty, I went and told the front desk and they could not give me my money back they told me I had to go on line an do it. "Wonderful Location! The staff at the Mountaineer Inn was also wonderful and helpful. Delicious Breakfast! Very clean!" The location of this hotel is central to so many things to do and see! There are 3 restaurants, a sheetz, a spa, a gem store, a very cool old railroad-walking trail, a playground, and beautiful views by the river and mountains all within walking distance of the hotel. The staff is very knowledgeable about the area and they were very happy to inform me of local interests and anything else I needed to know. They also attended to my every need and detail for comfort. I was very impressed with the cleanliness of the entire facility. My room, was especially clean, and equipped with everything I needed to make my stay quite enjoyable. I cannot wait to return! This a perfect getaway spot for families! Updated lobby, bathroom, breakfast area. Pet friendly hotel. They only charge a 1 time per fee, not per night, not per pet. A major plus. Accepts AARP, so we got a discount. Breakfast area now has seating and tvs. And hot food! "I will not be staying there again." The room was not very clean and it smelled the minute you opened the door. The mattress was very hard and the bathroom was to small. As far as the A/C goes it was either freezing or hot, there was no in between. They never cleaned the room and we needed to call down to the front desk for more towels. The Wi-Fi was intermittent at best. I will say the staff was friendly and the hotel allows pets. Thank you for completing the survey regarding your recent stay at our property. On behalf of our entire team, I would like to apologize for not exceeding your expectations. Your satisfaction is important to us and I hope that you will consider staying with us again so that we can have another chance to provide you with a superior experience. If I can provide any assistance, please don't hesitate to contact me directly at 304-599-5399. I absolutely love this hotel. Everyone is so nice and helpful. Breakfast is great. I stay here every time I visit my daughter at WVU. The price is great and the rooms are clean and beds are very comfortable. I would recommend this hotel to everyone. 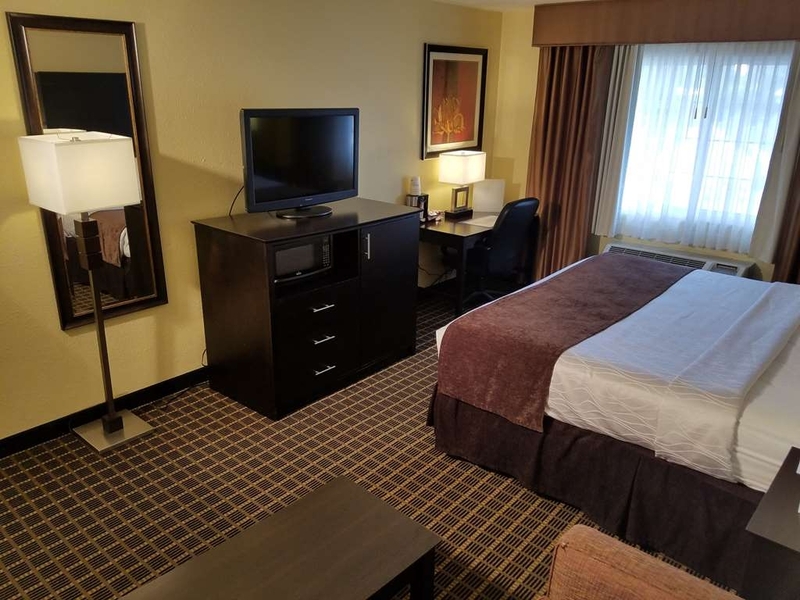 "Relaxing, Good Location, and Spacious"
Well rounded hotel and centrally located. The swimming pool was the best. Spacious rooms. Parking spaced wide. Hanna Kepner - Front Desk was an outstanding employee. Exercise room equipment excellent. Good value comfortable and quiet room with above average breakfast. The decor was plain. Exterior appeared recently painted. Parking lot in good condition and plenty of ample size spaces. Friendly staff. I would stay again. What would make it better? Bright lights for reading and no TV blaring away at breakfast. We had 6 rooms and they took great care of us. We arrived late but they were waiting on us and had our rooms ready. We had a problem with the AC in a couple of rooms but they moved us quickly to rooms that were working. There was 2 staff members that went and above and beyond the call of duty while staying here for the last 4 days. Chris cleaning the second floor ! He brought me extra towels and soup. Also the breakfast lady ! She was great. However the wifi only worked about half our stay ! The beds were very hard ! The rooms need updated ! I did appreciate that they had a printer in the lobby. They had Hot Cocoa in the lobby which was good. The excersise room was good. Our Hair Dryer in room 221 did not work. I reported it earlier in the stay and I told them it worked as it started working again but then it quit again. The hotel on the hotel looks sad on the outside. It needs a facelift. Thank you for completing the survey regarding your recent stay at our property. At Best Western we strive every day to provide a superior customer experience. On behalf of our entire team, I am sorry we weren't able to do that for you. We will use the feedback you gave us to implement improvements to ensure we provide a better experience in the future. Because we value your business, please consider staying with us again so that we can have another chance to provide you with superior service. "Great hotel for price and value"
Nothing too fancy but for the price it is tough to beat. very reasonable rates and very good management. Breakfast is the same as others which is good. Everything went smooth. I stay here once a year due to location and previous positive experiences. "Is this really a Best Western hotel?" I don't usually review chain hotels but I have to make an exception with this one. Best Western must have slackened their standards or inspections. There were 8" high square curbs in the parking lot that used to hold light poles that were not easy to see when other cars present. It was obvious that many other cars had driven over them. When reported to clerk was told that management would be advised. The card controlled door nearest the room did not work from the outside. The a/c did not cool the room which became warm and very humid at night. The tub and shower curtain had mold and mildew on it. Upon waking we found the bathroom and sleeping area full of knats. It was obvious that an attempt was being made to upgrade this hotel but the quality of work was lacking, especially in the bathroom. Thank you for completing the survey regarding your recent stay at our property. On behalf of our entire team, I would like to apologize for not exceeding your expectations. Your satisfaction is important to us and we will be using the feedback you gave us to implement improvements to ensure we offer a better experience for guests in the future. I hope that you will consider staying with us again so that we can have another chance to provide you with a superior experience. If I can provide any assistance, please don't hesitate to contact me directly at 304-599-5399. 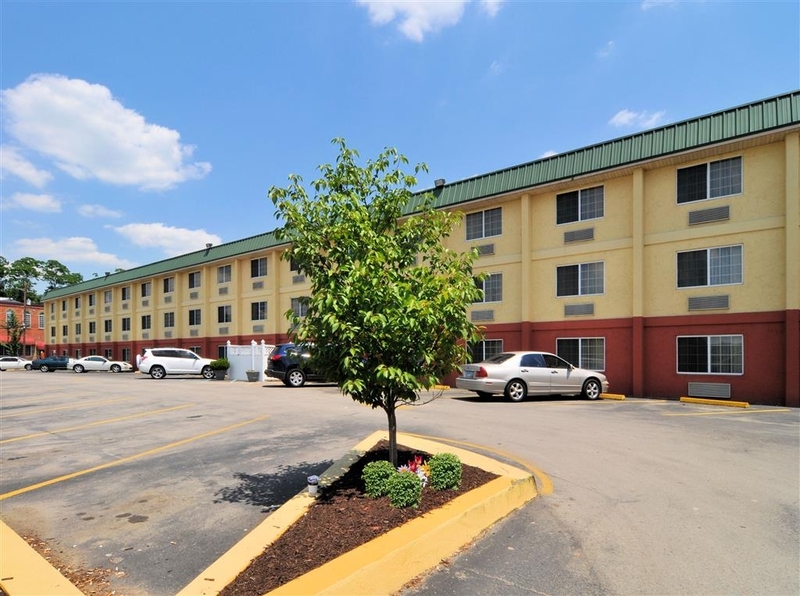 "Great location to WVU and attractions"
Hotel was clean, quiet, and reasonable. Morning breakfast was excellent but stay away from the biscuits, far too dry, almost burnt. Staff was very friendly but housekeeping could use some additional help. 100 rooms to clean each day and only 4 peopje to do it....but room was always clean and towels and toiletries replaced each day. Wellbworth the reasonable price. Hotel is also pet friendly. Have been staying here for three years now. This is the first time we experienced an issue with the bed which was uncomfortable. Not sure if all the full size need are the same but never an issue king. We booked two rooms for a stop over on our way to Disney. The hotel is located conveniently near the highway. The hotel is very pet friendly but we were not travelling with pets, we do not have pets. It was OK for a one night stop over. There is a river close by if you want to go for a walk. Have mixed reviews of this hotel. If it was possible I would have given this hotel a 3.5 rating. Hotel is set up weird. It would be a major pain if traveling with someone with disabilities. Room was ok except for the loud A/C unit. Also A/C unit needs cleaned out. Breakfast was decent and the breakfast attendant was very nice and on top of things. But for a single night this hotel would be ok at the 70 to 80 dollar range. Not a penny more though. "Great experience! Clean hotel. Exceptional service. Great breakfast. Location ok of hotel." Rooms smell damp and moldy. Renovation work is poorly/half done....equivalent to putting a red-ribbon on a prize pig. Overall property poorly maintained. We will never return. Staff was warm and welcoming, from check-in to housekeeping. I felt sorry for them, considering how bad the hotel is. On behalf of our entire team, I would like to apologize for not exceeding your expectations. Your satisfaction is important to us and we will be using the feedback you gave us to implement improvements to ensure we offer a better experience for guests in the future. I am sorry that the renovations were not satisfactory for you. We appreciate your comments and will be sure to relate them to ownership. Thanks Again!!! We stayed at this hotel for the Moutainfest Rally. Abby and staff were very friendly and accommodating. The hotel was very clean and the beds are comfortable. The shower has great water pressure. There breakfast is good and a nice location for the area. "Humans vs. Pets - No Way"
We stayed overnight on May 30, 2017. Bottom line is, the human is the one with the money to spend on the accommodations not the pet. Humans should come first in your procedure manual. I am very disappointed that you had us in a room on the second floor next to a barking dog/s. There are still people in this world, WHO do not wish to share a room/area with a pet (otherwise) I would have a pet. Some people do have severe allergies to animals. You should have a designated/restricted area for pets only, if you are that desperate to fill your hotels. Last time you will see my family as a customer. of yours.. Thank you for taking the time to share your review with us. We appreciate your valuable feedback as it helps us identify the areas we can improve the guest experience. I was disappointed to learn of the shortcoming you experienced. We have designated pet rooms/locations and I sincerely apologize that you were placed near them. In the future we will be sure to keep at least 1 room separation from our regular traveling guests. Again, I am sincerely sorry for the inconvenience and thank you again for sharing about your recent experience. Couple in transit stayed here for one night. The room was spacious, clean, well equipped. Staff was also great, very professional. Breakfast was delicious with many choices. The hotel also has a fitness room and a salted water pool open 24 h. I highly recommend this hotel and when we will have a change we will for sure go back. My first night I found roaches in my nightstand, to such an extent that I would kill one, turn around and when I turned back there would be 2 or more back. They happily switched my room, but to a room that was being fogged or odor treated at the time, finally received an upgrade and didn't see any signs of bugs or anything but talked to another couple that was leaving because they had found bed bugs. The staff was very helpful with every problem, but when I stay at a hotel I shouldn't have to switch rooms 3 times because of problems. On behalf of our entire team, I would like to apologize for not exceeding your expectations. Your satisfaction is important to us and we will be using the feedback you gave us to implement improvements to ensure we offer a better experience for guests in the future. We take this issue very seriously and conduct regular inspections of our hotel rooms. The rooms in question were immediately treated by a leading company that specializes in this issue. Thank you again for reporting the issue and rest assure this issue has been fixed immediately. generally nice facility and pet friendly though pet rest area at rear is hard to find and poorly maintained. Exterior rear card reader is finicky. Limited parking and very little for towed vehicles with tight access turns. "Keeping the "Shiney Side Up""
I am a Harley Davidson motorcyclist. I have been very pleased with our experiences with Best Western while touring. I appreciate the motorcycle wash stations that they provide as well as their pleasant / clean accommodations . We were late arriving at this hotel. We needed information on our travels for the next day but were too tired to do anything about it. the girl at the desk kindly looked up what we needed and put mapquest information under the door with our express checkout. We liked this hotel. Very clean and comfortable. If you want a fancy hotel, there are other choices but if you want a decent room at a decent rate, this is it. Friendly staff, welcome atmosphere, decent breakfast. Close to Morgantown restaurants and Colosseum. The remodel was an excellent choice and it helps a lot. It's always dependable. We would stay no where else when we are on vacation in WV. The staff is awesome. They are quick to fix any problems we have. They are always able to give us ideas on new things to do.The rooms are generally always clean and neat. The beds are comfortable. Breakfast is my kids favorite part. We love the food. The pool is a little cold but it is comfortable. Overall great experience. Friendly staff & super clean facilities. Great price & location. Highly recommend. Prompt check in & out. Breakfast was good & the lady caring for the breakfast buffet was very nice! "Very good place to stay. Close to everything." I enjoy the quietness. Good sleep and feel safe. Have great lighting around the place. I stay there to go and see doctors. They are always very nice. They will help to accommodate your night or nights stay. Very compassionate when you have doctors appointments. This hotel was very easy to find off of the highway after flying in from the Pittsburgh, PA Airport. It is very close to stores, restaurants, and gas stations. The quality of the room was ok, not the best I've stayed in, but got the job done! We came out for my friends Wedding and were on a budget. They have a 24 hour pool, and a pretty decent breakfast selection in the morning (Eggs, bacon, biscuits & gravy, juices and coffee!) The rooms could be a little up-dated, but the layout was quite nice for under $70 a night. They are also pet friendly. "Very dated hotel, not up to Best Western standards"
The facility is very dated and in need of serious repair/remodel. This is not up to the normal standard I have found for Best Western facilities. If we had not been using a free reward night, I probably would have asked for a refund and found another hotel. Did seem clean, just really old. "Almost didn't stay there because of the price. Great value for the buck." Rooms were above average, parking was 1-2 stars, but hallways are not straight and require guest to go up/down stairs. Isn't great for my 74 year old father who barely walks. We had to help him down stairs so we could get to the breakfast. Staff was great and the breakfast was good. 4 stars. GREAT VALUE FOR THE $. we almost didn't stay because it seemed too cheap. Just a stop along the way to Disney World with my family. Good price but awful bed and not up to date or very clean. Front desk staff were extremely friendly and welcoming. Breakfast was not that great. Friendly staff, clean room, great breakfast! Looking forward to staying again in the future. Bonus for me there is a TJ Maxx along with the dress barn close to the hotel. Cheddars is also one on my favorite restaurants. Small thing but I found the washroom small. Worst hotel stay ever early morning desk clerk rude when asked about the house keeping done on our room I was told that they get to it every couple of days that nite it still wasn't done. House keeping got around to cleaning our room after having to send the hotel manager an ugly email asking why long term quest are treated as second rate guest. The young male front desk clerk is extremely rude and disrespectful. The indoor pool is not heated. The beds are not queen they are a smaller full. The hallways smell of cigarette smoke so bad it will choke you. The side entrance door was left open all night by the front desk clerk. (Felt very unsafe) The best asset to this hotel is the cleaning staff. I do not recommend this hotel to anyone...There are hotels in the area with the same price range and better conditions to stay at. Good location bad conditions. "offered bonus points never received"
They have done a great remodel here. Beds, pillows, and shower were great! Breakfast was hot and served graciously. Hot coffee available 24/7. Only drawback is that the bathroom was very small...door hits the curtain rod and no Food Network on cable. I must say I was having surgery, a surgery we were concerned about, so the nerves were on edge. My husband and I pulled in to check in, was greeted with a great smile and such ease of getting our room. We got to our room and the king size bed was inviting and comfortable. I must remind, I was having surgery the following day and had packed my own toilet tissue as most hotels do not have great toilet paper, I was not in need of using my tissue I packed!!!! I was able to relax on the loveseat, watching television and felt safe. My parents and husband enjoyed the breakfast. After returning from surgery and being sore, the bed was comfortable and it was quiet giving me the time to relax and be healing. I would so recommend Best Western Mountaineer Inn to family and friends. Very nice professional staff. Clean rooms, easy access to collisium. Easy access from Rt 79, right off the exit. Not expensive compared to other hotels in the area. Breakfast was nice, hot and a lot to choose from. "Will stay again for price"
This was a good hotel. The breakfast was really good and the lobby looked really nice. The bathroom in the room was very small, it was really hard to use the toilet because you couldn't open the door all the way because, of the poor design. No problems with the WiFi but bed was very firm (too hard). Renovated room, comfortable bed...we had an accessible room, however, you must go outside to get to the lobby if 3 stairs provide a problem...in the back and very quiet..hotel was busy...harlem globetrotters arrived in the evening! Dining choices are great and nearby! This was a great hotel. We were returning from a trip and found this hotel in the coupon book. They honoured the coupon and we had a really nice room and enjoyed our stay. Probably one of the best complimentary breakfasts we have had! Only downside was the condition of the elevator decor as a first impression. Stay here for Football training for my son. Good Hotel, great price. Service was super good, friendly staff. Rooms are clean but bathroom is somewhat small. Breakfast was good and staff was always keeping the area clean. Breakfast included waffles, scrambled eggs, bagels, donuts, bread, biscuits, sausage or bacon, gravy, yogurt, juice and coffee. This Hotel accepts dogs, which is a plus for those of us that have an extra baby. Check-in process was easy. The hotel has a board named VIP Dogs, which shows the names of the dogs that are registered, my kids loved this, and they were so exited to see their puppy name there. To me it shows that they do care about you and your family. Would return to this one if need to get back to Morgantown. We stay here often . It is in a great location with several shopping and eating areas nearby. It is quiet, clean and has a great breakfast. Close to shopping and good restaurants. Sheets is next door where we paid $2.13/gal for gas. The hotel lobby is lovely but don't be fooled because there is work to be done with the rooms in that doors and walls are old and damaged and dirty. Cigarette smell in our room even though it is a no smoking sign. Entrance to the rooms is littered with cigarette buts and reeks of smoke. Not a good welcome. "Stopped on a road trip"
Was travelling through WV on a road trip and stopped here for the night. We didn't have a reservation, but they were able to accommodate us and gave us the pay-in-advance price. The room was clean and well appointed (including a microwave and fridge). Free breakfast was convenient and express check out had us on our way in the morning. "They don't care about their rooms"
I stayed here three nights in a row. First room, the hairdryer didn't work. Oh well I don't have long hair anyway so it doesn't bother me. Third night I changed rooms. This time, the light switch for the lamp between the beds was not functioning properly. Extremely frustrating. The shower drain was also clogged with what looked like about 2 years worth of hair and grime. Disgusting. It's unfortunate because this would be a great place to stay if they gave a crap about their rooms! Good value.Comfortable rooms. Extremely satisfied with the beds, bathroom,cleanliness and breakfast items . Excellent wifi. Friendly and helpful staff .woykd stay here on future trips. The location is also very good. This hotel offered the good service we've come to expect at a Best Western. We asked for a room at the back for some quiet and had the best sleep of our trip. The pool was warm, the breakfast was great and the staff was helpful. The hallways & stairways are a bit confusing though. The elevator (which needs some updating) is situated in the center of the building, but the front desk (updated) is on the far right. When I used the one set of stairs, it only got me outside - not to the lobby - so I walked around outside. Apparently the stairs on the other end get you to the lobby. We were on a long trip to the east coast. It was the end of the day and we had not made prior reservations. We stopped in the lobby to see if they took pets. This particular motel did. We stayed the night. It's a long walk to the lobby. There were no places on the property to let the dog relieve himself. Had reservations for 10/21 thru 10/23 for TCU game. Checked in, smelled mildew and must in room. Killed bug#1 on outside of bed, killed bug #2 on bathroom counter. Came back out to bedroom to take a drink of water, while looking up on ceiling, saw 2 more bugs crawling. Grabbed my stuff and couldn't get out faster. Had to pay more to find rooms in sold out hotels. Still awaiting my credit card to be credited for the cancellation. I did however, see the charge right away. "Best Western - A Tale of Two Hotels"
This hotel is a little scary upon arrival. Although near a busy commercial area, it is tucked into a hillside with homes and business that are not so welcoming. When we arrived (around 7:30 pm), there were several people smoking in the parking lot, which itself was dark. The exterior of the hotel is old, and it doesn't get any better in the light. The hotel lobby and common areas are almost as bad as the outside. That's the bad news. The rooms seem newly updated and quite nice. WiFi was free and fast. We both slept well. Bottom line - if you're looking for a place to sleep, and don't care what the outside looks like, for a reasonable price, this hotel works. Big plus, for us, it was dog friendly. And very near WVU and all activities. "Would stay here again Book at welcome centre for a good discount"
"Great place for College Visits"
Overall a good place to stay. Very clean, the staff is extremely helpful. Breakfast is ok. The typical menu of pancakes, scrambled eggs, breads, cereal, yogurts, fruit, etc. Good coffee. The pool was very relaxing and inviting. Only negatives are the placement of the toilet paper, it's out of reach and the internet. We had trouble connecting to it. well i stopped at another hotel but it was fill up ,I think they must of had some kind of sporting event going on alot of people there. The hotel was ok, clean yes but the 2 beds we had was more like a full bed instead of a queen..there is alot around here to shop and eat at . so you will not go looking to far.Every place we did want to eat at they were stand outside waiting to get a seat,so had to go to cici pizza.So i would say the hotel is clean and very close to everything,a little high for the room but you did get a continental breakfast,free WiFi, plus a fridge and microwave..
We were in town for a UVW game. Very small bathroom but also very clean. We managed ok since we weren't in the room much. Staff was friendly and helpful. Price was about half of the other places in town since it was game weekend.. it worked out ok for us. Had a wonderful stay at the BW in Morgantown WV. We visited our son at WVU and brought our dog...the staff was accommodating and very pleasant! It's very close to the college as well as shopping and restaurants, makes it very convenient and less of a hassle which gave us more time to enjoy our visit! This motel was clean, priced well and had everything I needed to make my stay comfortable. My room had a refrigerator and microwave also and that was convenient. I would definitely stay at this hotel again and have in fact already referred several others to choose this hotel for their next stay. The entire hotel did not have hot water. We reported the problem to the front desk in the evening and were told that the maintenance person was off work that night and none of the managers were responding to messages from employees regarding the problem. The problem was not fixed by the next morning so it was cold showers for everyone. We complained again when checking out and the front desk employee did not apologize or offer a discount. Bad experience! Room was clean . Staff at front desk was very nice and helpful. Only problem the hallway to room was very dark and old. The pet option is nice . They had dogs checked in but I never heard them. Breakfast was good. I will return. They had a drawer in the lobby with games and books to use . I liked that and left my book that I was finished with . Nice idea. I've stayed at a few Best Western's and this one was pretty average. The lobby had obviously been remodeled recently but the room we were in seemed a little worn. The room was fine (a little humid all the time) but clean and well kept. The bathroom was extremely small. Breakfast was plentiful and had a lot of options. There was nothing terribly outstanding either way, good or bad, from this hotel. We stayed here with our 2 dogs(first time traveling to hotel with dogs:) The dogs enjoyed it as well as their owners:) Our son goes to WVU, he is currently a freshman. We will be spending many stays at this hotel over the next 4 years! The room was very clean and included microwave and refrigerator. Breakfast was good. The layout to get to the lobby is odd. The elevator makes strange noises but works fine. We stayed a second night and were pleased with the service. "If in Morgantown this is a nice clean hotel"
Better than average Best Western hotel. The pool being open 24 hours was awesome. Staff friendly all around. Room nice. Priced fair. Housekeeping was very attentive. I will book this hotel for my visit next year for the third year in a row. On the Surface, this hotel might seem dated, but inside, it is clean, updated, and comfortable. 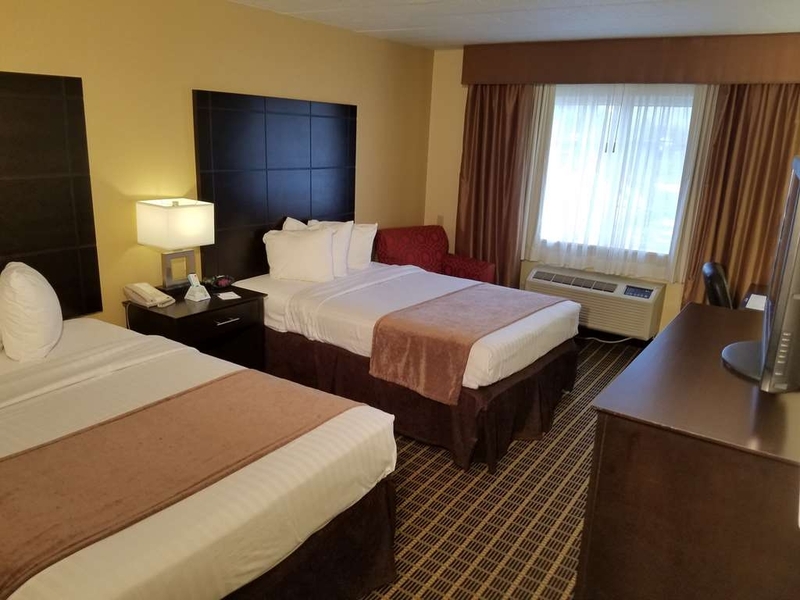 No problems with the room, everything was clean and updated, and it was conveniently located about one easy mile from I-79. Brought our son to college and had to stay over night with our dog. BW made it very easy for us and stress free! The college is a few miles from the hotel and the area is filled with restaurants and plenty of shopping. The hotel is clean and the staff is very friendly and very accommodating...we had a wonderful visit. We will be coming back in the future for the football games! Staff was friendly and helpful. They went out of their way to ensure our stay was comfortable. Rooms are clean and functional but bathroom was very small and needed updating. Location is close to stores and restaurants. Abby is a wonderful desk clerk. We didn't have a reservation, but she made it easy and simple for us to get a room. She really makes you comfortable while you are there. We ate breakfast and it was OK with good coffee. Room was clean and comfortable. Dear nvb50, Thank you so much for taking the time to leave us this kind, supportive 4 star review here on TripAdvisor! We are so thrilled to hear that we were able to get you safely off the road and set up with comfortable accommodations at a reasonable price! We will be sure to pass on your kind words to the staff here at the hotel! Let us know should there be anything else we can do for you along your travels! Good clean motel. Staff very friendly and entire hotel is biker friendly. Staff accommodated us every night by allowing us to use the breakfast room for order in food dinner. Pool very clean. Staff also set up a bike wash out back so everyone could clean their motorcycles. Breakfast staff went out of her way to make sure everyone had sufficient food and drinks to keep everyone happy and ALWAYS had a smile for everyone Close to restaurants but since it was raining so much we opted to order in. Best western motels have a certain standard, and this motel rose above that standard. Our room had a frig and a microwave. There was coffee and fruit in the lobby, and the continental breakfast was superb. Also worth noting is the fine location. There are shops and restaurants very nearby (right across the street). our stay was pleasant and peaceful. my daughter enjoyed the pool and so did my husband. the bed wasnt the best but we were able to sleep. however the a/c smelled like mold. the bathroom was very clean. downfall was that we could hear everything that was goin on in the rooms that were on either side of us. Dear Lennie V., Thank you for taking the time to give us a review. I am pleased to hear that the staff was able to satisfy your needs while staying with us. Next time I hope we can exceed your expectations with the new breakfast area. I look forward to having you again in the future and hopefully getting to meet you during your next stay. Thank you for choosing Best Western Mountaineer Inn and safe travels. "I'll pass on this place"
Lobby was inviting but staff had better things to do and weren't welcoming. Room was clean, but bed was very uncomfortable. husband and I both woke with sore backs and sides. Pool was nice. Breakfast was wonderful! Nicest worker in the hotel was the lady in the dining area, very accommodating. If you have a pet, make sure it does its business on blacktop. No grass area to walk them. I had to take mine down the road. Due to lack of comfort and non-pet accommodating, we will not stop here again. Dear Taylorboys, Thank you for taking the time to fill out a review for others to read. I am delighted to hear that the staff was excellent and I know it is always moral building when guest use words as you did to describe their service as we strive for guest satisfaction from all our guest. I am glad you had a chance to join us for breakfast in our recently renovated breakfast buffet. We have expanded to enhance the breakfast experience while staying here with us. 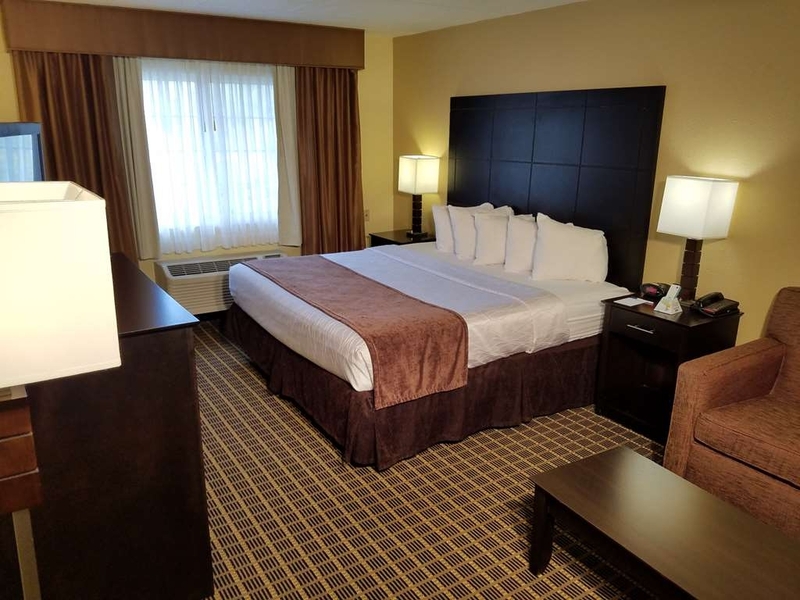 Thank you again for choosing Best Western Mountaineer Inn for your traveling needs and I hope that if you are in the area again you stay with us. Safe travels! We stayed here for my son's WVU orientation. The room was "stinky" as soon as we opened the door. We both noticed it. The smell just smelled like "old motel with dirty carpet". We hoped that turning the AC up would change things, but it didn't. Hotels should smell fresh and clean. That is the first thing someone notices. Beds were not comfortable. Thank God it was only one night. Not worth the $100 I spent though. With him staying in the dorms for the next four years, I will be coming to Morgantown at times, but will choose somewhere else to stay. "Big fan of BW, but this one disappointed"
Contrary to the reviews I read here, the hotel was run down and in need of repair. Yes, there were some renovations made to the lobby, but the rooms haven't been updated in a long time (at least not the ones we had). The staff were accommodating, but despite several attempts, they couldn't get our TV remote to work for us. I was surprised that Best Western allowed it's name to be affiliated with a run down facility like this one. I have been a big fan of BW's over the years. Unfortunately, this one was a disappointment. The Mountaineer Inn is a great place to stay, the bed was comfy, the rooms were very clean. The breakfast was wonderful, my wife enjoyed the sausage gravy and biscuits. We recommend this hotel to anyone that may need a place to stay. The staff were all friendly and polite. We will stay here again when we are in the area. For this level of hotel to have a saltwater pool, I am pleasantly surprised. The staff were all polite and very helpful. Great recommendations for local restaurants. The rooms were nice and clean. 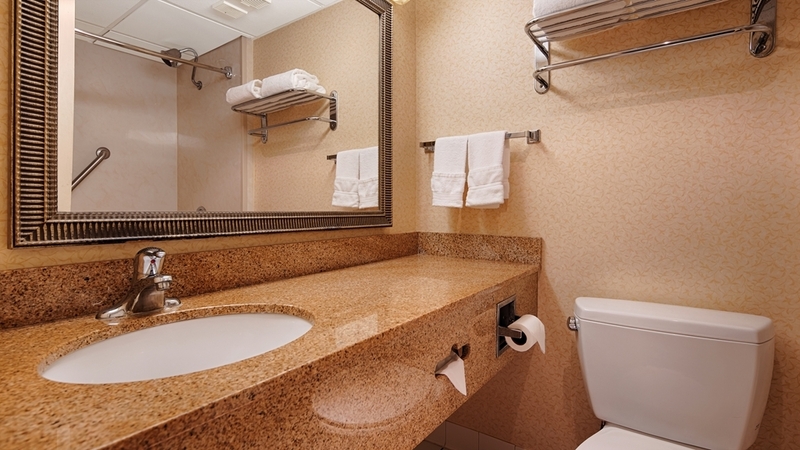 Only downside is the sink is in the bathroom, not outside the bathroom like many hotels now. Besides that everything was fantastic. Staff helpful and friendly. Recently renovated areas. Lobby and bright breakfast room. We had a ground floor and found slightly musty. Room clean. Breakfast great and wonderful friendly breakfast lady! Enjoyed our stay. We were in West Virginia for college purposes. The hotel was so close to the campus and in a good location. Very nice, clean and staff was great. I would recommend this hotel. My big thing is that the room is clean and it was. I liked the fact that we were a minute away from the Evansdale campus. I will definitely stay again. Staff were very friendly and accommodating. The rooms were clean and updated. Breakfast was amazing, delicious, not what you would expect for a free hotel breakfast. We were driving home from myrtle beach and mentioned we were from Canada. With a Canadian ID, we were given a cheaper rate for the room which helped out. Also offer discounts for people with AAA or CAA. Will definitely return on our next trip back down south. If you are going to a race at High Point Raceway this is a great location. There are many restaurants, shopping within just 10 to 15 min. from the track. you won't be disappointed. Have a great stay and hopefully as Great a Weekend as we did !! In town for a class at WVU. Hotel is very near the campus, very clean and in good repair. The lobby and breakfast areas are better than most other BW's and the staff was very friendly and helpful. I will stay here again on my next visit to Morgantown. Dear Gerald C., Thank you for taking the time to review our hotel. Our staff is one of the friendliest you will ever meet! We want you to feel like your at home. Thank you for choosing us as one of your preferred hotels. With so many new choices we appreciate the loyalty. We look forward to your next trip in to visit WVU. GO MOUNTAINEERS!!! This hotel has been recently renovated and they've done a great job. The outside needs to be updated a little, but soon as you walk in there's nice flooring, new carpet, a nice new electric fireplace in the lobby area with new furniture. Off to the right side is an updated pool and to the left was a huge breakfast area. Btw, the breakfast was good with a waffle maker...they should add another machine as I waited a little and people waited for me, but they also had sausage and gravy with biscuits, sausage patties, scrambled and boiled eggs. They also had yogurt, muffins, bagels, and donuts. Check in and out was exceptionally fast, which is needed on a long trip. One downside was my room was all the way in the back on the side by a door that didn't work to get in...hopefully that is fixed soon because I had to go around to open from the inside to haul our luggage in. However, when we walked in the room it was very spacious and super clean. A flat screen TV, searing area, the bed was super comfy. The bathroom was great with the exception of no soap dispenser, but oh well. I really enjoyed my stay. Staff was great and helpful. I would definitely stay again. Other than traffic once you get there it is a virtual oasis! Great service exceptional staff and a beautiful room! Renovated breakfast area with lots of diverse food choices. Lots of parking in well lit lots. Close to exceptional dining including my favorite the Texas Road House just across the street. The stay was nice. Clean and staff was great!! The room was very nice and the breakfast area as been remodeled and made much larger. Location is really good for the areas I needed to be in Morgantown and surrounding areas. Great place. We have a good time. The place was wonderful, the people were helpful. I would refer it to friends and family. It was close to my my son's graduation venue. It was close to restaurants and stores which made it very convenient. Once again we stayed at the Mountaineer,it was a great visit. As Canadians we were given a good rate. The new look is wonderful, the breakfast room and front desk are very nice. The breakfast was very good and the coffee was outstanding. The front desk was helpful. Clean and comfortable room, bed very comfy. Quiet area. Staff friendly and helpful. Good stopover destination for travelling from the south or north. Close to I-79. Great shopping and dining close by with lots of choice. Wonderful greeting, welcomed our pet with a gift which was well received. Everything was paved, so had to look for a spot for dog to do his business. Overall building is tired, but ok, just there for a night. A sports team cleaned out breakfast so little to pick from. We have stayed at this Best Western numerous times and we have always have very friendly and helpful people. They have remodeled the lobby and breakfast area and it's very fresh and new. Our room was clean and in very good shape. We had to be at the hospital early so they gave us each a to go bag for breakfast. Very nice surprise!!! This was our first night on our way to Myrtle Beach and we were very pleased with this hotel choice. Staff were terrific and very helpful with their dinner recommendations. We chose Pizza Al's which is just down the street and weren't disappointed. Breakfast was good after a good night's sleep on a very comfortable bed. Just because I gave it 3 stars doesn't mean it's not good. It is undergoing renovations. Somethings just can't be updated though. It is clean. No worries there. They are VERY pet friendly. For that reason alone I will be back. They even had a VIP Pet board and put my dog's name on it and included a doggie welcome bag with treats and a tennis ball. Staff was very nice. Just very nice people. Breakfast was better than most free breakfast offerings. I'd recommend the hotel upgrade to HD tv signals though. It's a bit frustrating to have nice HD tvs with a terrible signal. Somethings just can not be upgraded... the bathrooms are tiny. It is a quirky hotel that seems to have once been 2 buildings now combined. Getting from the guestrooms to the front desk is a bit of a maze. We had a few issues... the 2nd floor ice machine did not work the weekend we were there. And the lock on our door did not work. Our room could not lock. It seems like its an issue that has happened before. Unfortunately the maintenance guy was not there that weekend so it could not be fixed. And because we required adjoining rooms, they could not move us. Ultimately we just kept the rooms and locked the offending door from the inside and entered the pair of rooms from the functioning side. Oops, forgot to mention, the pool and fitness center are open 24 hours. They are away from the guest rooms so I didn't worry too much about noisy kids. We purchased our room from priceline express deals and got a very good rate. I'm not sure I would have been as happy paying the stated rate. We stopped here on our way through and were impressed with the size, cleanliness and comfort of the room especially given the price we paid. There was a mini microwave in the room and a bar fridge. We could not control the fan on the heating/ac so it was a bit loud. Nice to have breakfast included. The hotel is close to a river with a nice park and walking trail which was perfect after along day of driving. Found out too late that it is only about a block away from the Terra Café which looked very nice. Patricia at the front desk was very professional & went beyond being helpful. The room was easily accessible, clean & welcoming. Highly recommend this facility. My only complaint would be the potholes in the driveway. Pleasant stay although rennovations are almost complete. Service desk, lobby and also halls undergoing remodelling. Not a big problem. Friendly staff and very clean rooms with fair pricing. Would recommend to anyone. Good location. I had a recent stay at this hotel and left my purse behind in one of the drawers when I left. I live 2 hours away and didn't realize till I got home. Called immediately and they were already trying to get a hold of me. Anyways they kept it for a hole week till u could make arrangements to go back. And just wanted to say thanks and what great people everything was accounted for and the people there were so awesome and amazing. We definitely stay there and no where else my next time there. Again thank you!!!!! Staff was friendly, and my kids really enjoyed the stay. Breakfast consisted of and assortment of pastries, yogurts, cereal, milk, and coffee. Front desk staff were polite and helped get us checked in and out in a timely manner. The rooms were very clean. Definitely a place I will come back to in future travels. I'll start with the positive: the staff was very pleasant and the free breakfast was what I expected - great for something to grab while you head out the door. The negatives though are not issues that I could live with and stay there again. I knew the lobby was under construction and that was not that big of a deal because honestly, you just check in and that's it. However, the hotel needs a overhaul. The hallways reeked of smoke and the small elevator was dingy and smelled of mildew. Our room did not have an order thankfully. We found it odd that there were no comforters on the beds, only sheets and a thin blanket. The phone in our room did not work so we had to call the front desk on our cell phone to request more blankets (which ended up being another thin one). The beds were uncomfortable and the bathroom was dingy. I think Best Western can do better. "A Nice Place, With One Big Caveat for the Management"
You will read the reviews complaining about the lobby and breakfast are being torn up. Ignore those. Who really hangs out IN the lobby, anyway? They are remodeling, and winter is the "off season". They are improving! Here are the pluses: 1. Room was clean, with plenty of space *(see note below) 2. Heat was easy to control. 3. Inroom fridge and microwave worked very nicely. 4. Bed was relatively comfortable. 5. Wifi may be one of the best hotel wifis I have ever used! 6. Pool and gym open 24 hours. A rarity! The minuse: 1. * Although the room is spacious, the bathroom is tiny. 2. Here is the thing that bothered me the most: Although I understand the remodel caused the breakfast area to have to be moved to 2 guest rooms, the breakfast was NOT a breakfast a diabetic can eat! I wish ALL hotel proprietors would get these facts through their heads: - About 10% of the population has diabetes, and we DO notice, and make purchasing decisions based on our disease. If a hotel shows no regard for the health of 10% of the population, we would rather spend our dollars elsewhere. - Diabetes is NOT about "white sugar", as most people ignorantly think. It is about carbohydrates (which white sugar happens to be part of). Breads, and grain based foods are NOT diabetic friendly. Carbs TURN to sugar in your system, aggravating diabetes. Bread and cereals, doughnuts and bagels alone do NOT make a breakfast. - Diabetics require protein. In their defense, there were a few yogurts and milk, and probably peanut butter (but what do you put PB on? ), but I was so disgusted, I never even looked. Most hotel chains set a minimum standard breakfast, that usually includes at least one egg product, and one meat. Better hotels provide more than one of each. Starchy breads, cereals, and sugar filled doughnuts alone are not even a HEALTHY breakfast for anyone! - Not all diabetics are dependent on insulin injections. Many, including myself, are "fortunate" enough to be controlled by oral medications and diet. To those of us that have that option, breakfast is not just a way to fill our gullet in the morning, but is medically necessary. To us, food is life giving and saving medication. I would think it may be a HUGE plus, to be able to advertise "Diabetic Friendly Breakfast", and attract more patrons. Checked in for a one night stay and found the hotel lobby under construction and that the pool was out of order. Got to the room, which was a little musty but livable, and noticed the cove base in the corner was pulled back exposing about a 3" hole going back into the wall. Molding in the bathrooms didn't extend to the floor and it needed a paint job. We were not able to have the featured breakfast because they couldn't keep the breakers on because the front desk had "rented those rooms they weren't supposed to". My hopes are that the rest of the hotel has higher quality wiring! Generally a bad experience, Best Western should be doing better at managing this property. The staff is very accommodating and friendly. You can tell they work hard to keep a nice clean hotel and keep the visitors satisfied. The two times I stayed there they got me whatever I needed with a smile and very pleasant. Megan at the front desk went way beyond the call of duty to accommodate us. She is a very friendly person and added tips on micro breweries and Crocketts Lodge. Hotel is dog friendly. Ask about the resident Golden retriever. Room is very comfortable,clean and a good price. The Mountaineer Inn staff works hard to make your stay comfortable and memorable. Kyle at the front desk is very helpful and always works to make your stay comfortable. The Housekeeping staff and Maintenance folks are friendly and caring always working to ensure your stay is pleasant. "Our Stay in Morgantown, West Virginia"
Our stay was excellent, We will stay there again. Our family is there and need to be close to them when visiting. The room was very good and comfortable. This is vary close to the UWV so family can stay there to be close to the students. "Much better value than other roadside hotels"
We stayed for one night to break up a long drive. The hotel was quiet and clean and the hot self-serve breakfast which was included was quite good. There is a small pool and fitness centre, nothing fancy but nice to have. The only thing we didn't like was a strong odour of oil in the elevator area, possibly coming from the generator at the back of the building. But this did not significantly affect our stay. Clean, great staff, fair decor, breakfast fair, maintenance issues, odor issues. Won't return, hard to find off of interstate, and price is a little high for what is offered. They need to work harder on conquering maintenance issues. We have stayed here several times and each time we receive courteous service, the breakfast is good, and the room is great. We recommend this hotel highly and will continue to stay here when we visit Morgantown WV. Great value, great staff, all the amenities you would need. Local to all of the University's buildings and residences. Restaurants are close by and this hotel is close to all major highways. Internet available for business purposes and pool and gym for personal purposes. Highly recommend. Last minute choice for stop-over. Updated comfortable room with nice linens and good size flat screen tv, fridge and microwave. Lots of fluffy pillows on king bed. Bathroom small and in need of upgrading bath/shower area but adequate. I would skip the breakfast...coffee not good, no whole wheat bread, pithy apples...but hubby says good biscuits and gravy. Can you tell which one of us eats healthy. Best of all was price. Saved enough to pay for dinner. I would stay again. Also, very nice staff. This hotel was convienently located and a very good value. Rooms are small and a bit crowded. The room was very clean and the staff was friendly and helpful. I would stay there again for a one night stay. "Great hotel just off I - 79 in Morgantown WV"
"want to have a great stay"
very disfunctional hotel. They don't know how or what to do with alot of their problems. We were over charged and it took a week to get our credit. Beds are bad. Breakfast / area was a joke, was not attended properly, the girl was inside front desk office , visiting I guess. Both mornings I had to tell them of things they were out of. Was to pay when I arrived and they charge me for 2 rooms/ 2nights the day after I made reservations, they kept telling me they didnt do that , My bank said different. VERY SMALL BATHROOM, Really couldn't even dress in there.Was a mess. outside doors were not locked at night not good for security? to many issues to list. "Used to be a great place to stay"
Not any more. We have stayed here a few times over the years on trips to Florida with our three kids. The hotel desk clerk was rude to my Mother when she asked about queen beds. ( this hotel very clearly has only doubles ) The rate was inflated for an aging hotel. Not one of Best Western's better locations. Tsk tsk. Need to be careful, you never know when a repeat guest may show up. We found a new spot for our trips down south. Service was pretty good. Room seemed to have been updated recently as the furniture & carpeting were in real good shape. Bed was a little hard. Internet service was pretty good. Like others have commented on the bathroom is small as in 1 person at a time unless one is in the shower. The toilet however seems to be built for children not adults, where did they find such a little thing? The price is good for GAME DAY weekend. 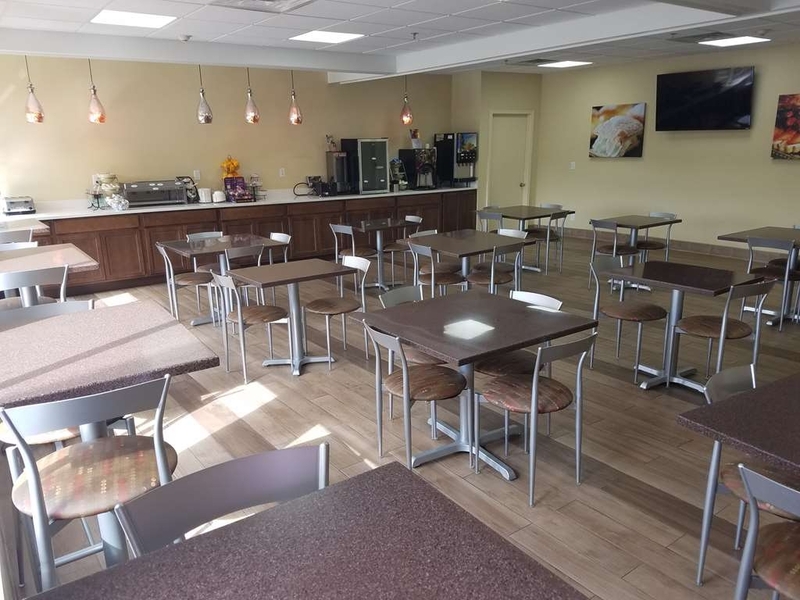 However, if you are looking for more than just a place to rest your head and eat a quick continental breakfast before the game, this may not be for you. The convenience of walking to downtown or walking to restaurants is not there. Rooms are cramped and it smells musty. Sorry.... However it is worth it to pay less than $400 a night in a fancier hotel. The staff is very pleasant! The management and staff are excellent. Service is excellent and rooms are clean. Food is good. They anticipate needs before they are even known. Reservations were easy to make and corporate rates were easy to establish. "Came in for a WVU Game will stay again"
Overall very nice for the price. Staff always friendly. My issue is the layout of the breakfast area (again). Need to expand into the "conference room" or put a coffee station across the reception desk or even in the "business area". Coffee/juice area is in the back corner with a line forming to use it. It is very busy and crowded. Customer had a dog barking on the floor below us on the second floor. Seeing something cold to drink on arrival was nice. We still would stay here. Somewhere I had seen there were renovations but I did not see any change.